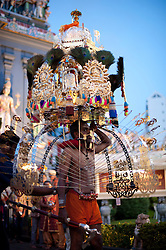 Thaipusam is an annual Hindu festival celebrated mostly by the Tamil community on full moon in the Tamil month of Thai (January/February). 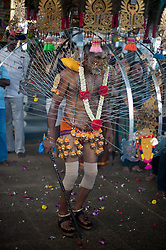 Pusam is the star which is at its highest point during the festival. It is mainly observed in countries where there is a significant presence of Tamil community such as South India, Malaysia, Mauritius and Singapore. 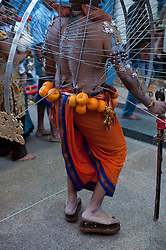 Generally, Hindus take a vow to offer a kavadi to idol for the purpose of tiding over or averting a great calamity. 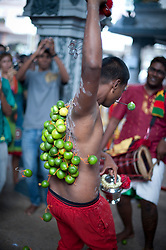 On the day of the festival, devotees will shave their heads and undertake a pilgrimage along a set route while engaging in various acts of devotion, notably carrying various types of kavadi (burdens). 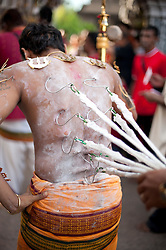 At its simplest this may entail carrying a pot of milk, but mortification of the flesh by piercing the skin, tongue or cheeks with vel skewers is also common.